In celebration of the This & That album release, legendary Jungle Brothers MC Afrika Baby Bam (USA), Tiefparterre Records turntablist Mr Dero (Austria) and freestyle acrobat Klumzy Tung (UK) combine forces to bring their inimitable style to a dancefloor near you this Winter and Spring 2015/16. 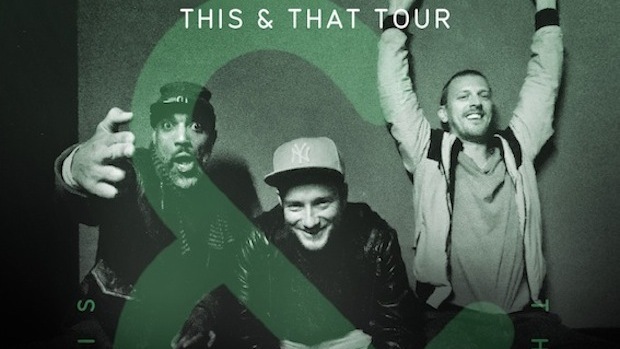 Hip hop classics, drum ‘n’ bass anthems, party lyrics, jaw dropping freestyles, state of the art turntablism, and a general ‘anything could happen’ energy leave their audiences sweaty and smiley. Just try not to shake your arse. We give you about 30 seconds…!